HotelTonight is a mobile business with its eye on a future. Specifically, the future where we will all have fast internet available on clever gadgets in our pockets. HotelTonight, which is just this summer launching in London, provides an app where users can book same-day discounted hotel rooms using their iPhone, iPad or Android device. It is a great example of a service that is made specifically to take advantage of the main benefit of the mobile device: solving a problem at the last minute, while on the go. Keen to try the service ahead of my meeting with CEO and co-founder Sam Shank in San Francisco, I found myself in something of a “the cobbler’s children have no shoes” moment; this technology journalist’s phone is too old for apps, and HotelTonight’s services cannot be used on a regular computer. Shank takes this in good spirits, pulls up the app on his iPhone and hands it to me. It turns out there is no need to spend time familiarising yourself with this app, because the interface is so sleek and the options so self-explanatory that you would be hard pressed to struggle. The app is designed to enable users to move quickly through the options, with minimum fuss on the small screen. It is hard to argue with this argument, as Shank is betting on a future trend – the spread of the mobile internet – that looks pretty certain. Financially the company is no slouch either, having just secured $23m in a fundraising round led by US Venture Partners, which includes participation from Accel Partners, Battery Ventures and First Round Capital. The group has now raised a total of $35.8m since its establishment in December 2010. Shank, who was also the founder of DealBase.com, a travel deals search engine, has a lot of travel sector expertise with him; his co-founders are COO Jared Simon, previously online-video production and distribution outfit TurnHere, and CTO Chris Bailey, formerly of DealBase.com and Adobe Systems. HotelTonight customers can book up to five nights, but the first night must be the same day. The app only shows three of hotels at any one time, meaning there is a level of unpredictability. Half the users are business people, explains Shank, using the app on last-minute trips or maybe after a delayed flight; “The other group of people are what we call ‘impulse bookers’. These are people that would otherwise not stay in a hotel at all. 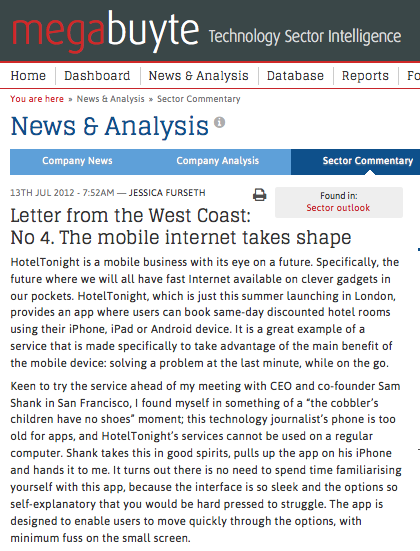 […] For the hotel industry [this means] it is not cannibalising, but it is growing the entire audience.” Another advantage for HotelTonight over the competition, according to Shank, is having the best booking process, the best merchandising, the best bargains and the ability to deliver the best quality guests to the hotels. Unlike in the UK, 4G mobile internet rollout is well underway in the US. Spirent CEO Bill Burns, whose company is a leader in testing the newest networks and gadgets for manufacturers, says the coverage is still patchy even in big US cities, but AT&T and Verizon are working on it consistently. What this means for people is that soon the internet in our pockets will be as good as broadband at home. Today, most people would be thrilled to get a broadband-level internet service on their mobile phones, and it seems a bit greedy to ask for more. But we will – increasingly better gadgets, expanding social networks, online phone calls and better video streaming services mean that soon we will ‘need’ faster data, and we will ‘need’ it not only at home but at our fingertips. Verizon and AT&T in the US are the furthest along with 4G, with progress also made by DoCoMo in Japan and providers in the Nordic countries. “In the UK, if one of the operators moves ahead with 4G the others will follow. They need to compete with those faster data rates,” asserts Burns. After all, the technology is already being developed to take things to the next level beyond 4G: LTE Advanced. HotelTonight is sitting pretty in the middle of a big trend, with founders wasting no time trying to pander to more dated models with lesser growth. Starting out as a purely mobile company means the likes of HotelTonight can create a product that is ideally fitted to mobile. This goes beyond designing the product to fit on the small screen, to truly taking into account the unique needs of a user who will be in different situations than those using a desktop computer: in the street, in a rush, maybe on a slow connection, and in need of something specific to their exact location. Posted on 07/13/2012 by Jess. This entry was posted in Technology features. Bookmark the permalink.